Is West Coast Left Coast or Right Coast? Is West Coast Left Coast or Right Coast? 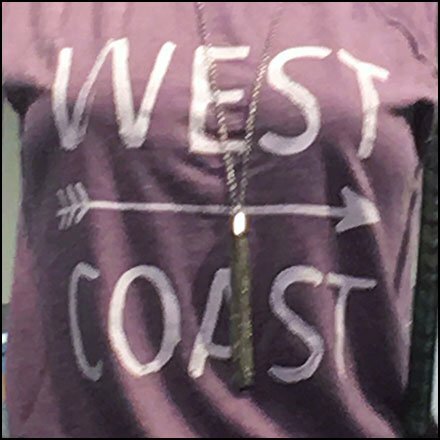 My first reaction to this West Coast sleeveless T-shirt was that it was directionally wrong pointing to the right not the left. But to the wearer, this West Coast pints “stage left” even though right to the onlooker. Making matters worse, inshore this arrow also pointed to the East Coast. You would need turn the mannequin around to point to the West Coast. Confused, I can only think this is a vials merchandising trap to snare unwary shoppers and get them engaged thusly with the display. What do you say? Is West Coast Left Coast or Right Coast? This display seen at Target, Allentown PA.